When we become one with the sea, a primal part of ourselves is released. We recover that instinct all human beings shared before we distanced ourselves from the living world around us. When we enter the ocean in a sea kayak, we combine with a greater force. We start to understand who we truly are and what we are capable of. The Pittarak is designed as a professional craft for expedition use. The Pittarak Expedition kayak covers all conditions. Check hatches are fitted and sit down correctly. Check that the bilge pump is operating correctly by placing your hand on the outlet and pumping until you feel air pressure. Check that foot rests, one of each side, are in place. There should be one set on single, two on the double. Check that the raise / lower rudder lines engage the rudder and that it moves left to right by operating the foot pedals. Your authentic Pittarak should always contain your own unique registration number on an authorized label, signed by designer Larry Gray. You need cradle roof racks that snugly fit the hull for safely transporting your kayak by car. Do not over-tighten the ropes as this can damage the kayak. For long journeys, it is recommended that you tie the bow and stern down to the bumper of your car and flag it. To carry the Pittarak to the water, pick it from the inner cockpit and place it on your shoulder. For a two-person operation, loaded or unloaded, use the carry toggles – one hand on the toggle and one hand under the hull. Both people should be on the same side of the kayak. Always check that your hatches are sealed before entering the water. Adjust foot rests to suit rudder operation and knee bracing. Ensure rudder control pedal is standing up straight. It is advisable for splash covers and life jackets to be worn at all times. When loading for a weekend or overnight journey, the rear of the craft should be slightly heavier than the front. When afloat, check that the Pittarak sits flat on the water and is not listing to one side. If it is, readjust your cargo until the load is balanced. Always launch and beach with the rudder up in a retracted position. Never lift the kayak by the rudder assembly or deck lines. When loaded, always place your Pittarak on an even surface. 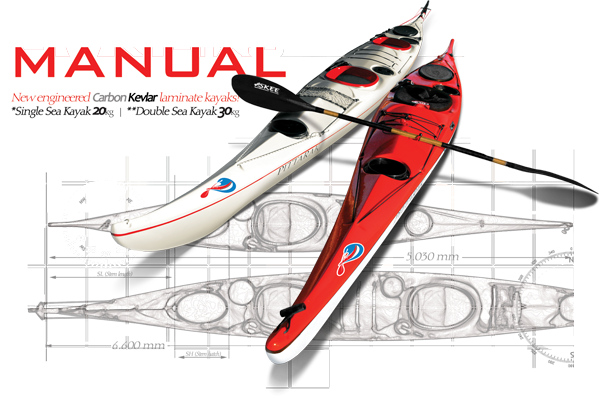 Pittarak sea kayaks can travel in expeditions in varied sea conditions. Professional advice should be sought for extended journeys. Always notify authorities in advance of extended journeys or for when paddling within dangerous or uncharted waters. Remove hatches and rinse in fresh water. Rinse all rudder assembly and sealing hatches thoroughly with fresh water and stow everything out of direct sunlight. Every month, coat the rubber with a protective solution. Pittarak is always keen to support your sense of adventure. Designer Larry Gray is a professional expeditioner and can advise on anything from suitable paddling opportunities for beginners to expedition planning.